The Level 2 Emergency First Aid at Work is a legally required course for any company or sector in the UK. This qualification fulfills the requirement for Health and Safety (First-Aid) Regulations 1981 and the Health and Safety (First-Aid) Regulations (NI) 1982. It is applicable to a wide range of emergency First Aid situations in low risk environments or workplaces with a small number of employees. For larger organisations or those with higher-risk environments it is recommended to complete the Level 3 First Aid at Work course. Why do this course with ELN? ELN’s Level 2 Emergency First Aid at Work course equips candidates with the skills and knowledge to undertake basic first aid and emergency action until further qualified medical assistance is available. Choose ELN for your QCF Emergency First Aid at Work course! Don't be confused by the large choice of providers on the market providing this Level 2 Emergency First Aid at Work course. Most training providers are NOT accredited. They are providing their own unregulated certificates. 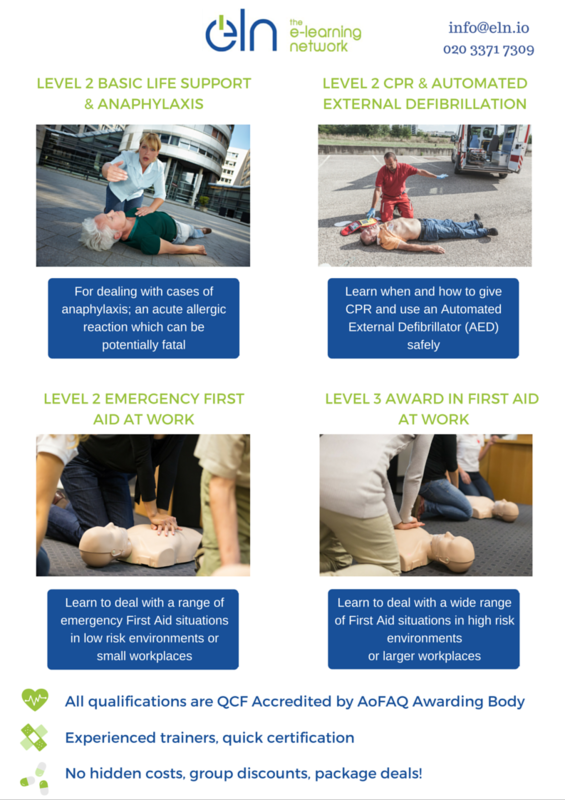 Check the HSE's guidance on choosing your First Aid Training Provider. Gain peace of mind and regulated, quality training by booking our Accredited QCF Emergency First Aid at Work course today. We are currently accepting in-house corporate bookings. If you are an employer and would like us to carry out EFAW training for all your staff, we offer special discounted rates for groups of 6 students or more. Simple, clear and transparent pricing. For larger numbers or a customised quotation to suit your needs, contact us straight away! Just click on the live chat below OR email us at info@eln.io. Salman is the Ops Manager and Internal Quality Assurer for ELN. Salman has been involved in educational businesses in the UK for the last 11 years at management level. He is a trainer, fully qualified Assessor, IQA and Lead Auditor. He has a wealth of training and management experience in various sectors like Private Security, Health & Safety, Education & Training and Manufacturing. Salman has a passion for all things tech. When he's not working Salman is to be found either researching the newest gadgets or learning how to become a pilot. This course is open to all candidates who wish to learn basic First Aid skills in low-risk work/office environments. Practical - Observation of administering First Aid and CPR.